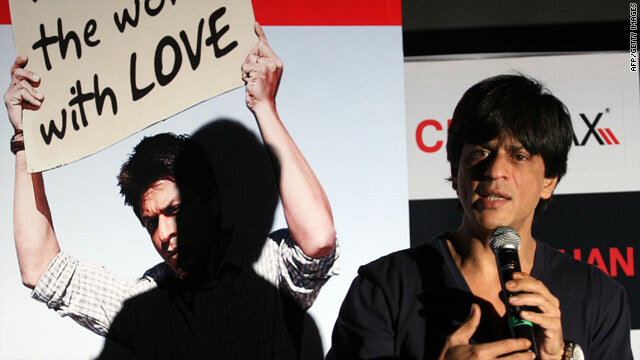 Shah Rukh Khan attends a promotional event for his new movie, "My Name is Khan," at a theater in Mumbai. (CNN) -- Putting a smile on millions of faces is all in a day's work for the reigning king of Bollywood. "I truly believe my job is to make sure people smile. I have no self-centeredness or ego about being a movie star," Shah Rukh Khan said recently. He may have simple intentions, but Khan, the world's most popular film star, has stirred controversy at home lately, which has entangled his newest film, "My Name is Khan." Backed by Hollywood studio Twentieth Century Fox, the film, which examines racial profiling in the United States in the aftermath of the September 11 attacks, is one of the few Bollywood movies to be distributed widely outside of India. What's more, it has had some serious crossover success. The movie had its European premiere at the Berlin Film Festival and has been released in several countries, including the United States, Canada, Singapore and Indonesia. In the United Kingdom, it set a box office record -- the biggest opening weekend ever for a Bollywood film. "I really want everyone to be happy when they see my film," Khan, who has inspired hero worship among fans around the world, said on the sidelines of the Berlin festival. But the movie, a love story that advocates tolerance and understanding, ironically has become the victim of division in India after protests triggered in Mumbai earlier this month. Members of far-right Hindu nationalist political party, Shiv Sena protested the opening of the film after Khan, a Muslim, expressed disappointment that no Pakistani players were selected for the Indian Premier League (IPL), the country's wealthiest cricket league. Khan told reporters that he didn't want to cause any problems or stress with his comments. He said he gets very "disturbed and scared and emotionally hurt when things like this happen." Despite the shadow cast by the protests, "My Name is Khan" has been a draw at the box office. In less than two weeks, it's taken in $6.3 million worldwide, with nearly half of that coming from foreign ticket sales, according to Web site Boxofficemojo.com. Khan plays a Muslim with Asperger syndrome, a mild form of autism, who is detained by U.S. authorities. A hero with a Forrest Gump-like simplicity, he sets out on a journey across the United States after the love of his life tells him to find the president and tell him that he is not a terrorist. ...I believe we need to just let everyone not be judged in terms of religion, groups or nations or region. The success of "My Name is Khan" is a testament to the far-ranging star power of the 44-year-old actor, whose global fan following also reflects the growing reach of Bollywood films. Described by some as India's Brad Pitt, Khan made a name for himself with his first full-length movie "Deewana" in 1992. Khan's so well known in India that he's often referred to simply by his initials, SRK. "My Name is Khan" reunites the star with female Bollywood star, Kajol, who plays the love interest. Karan Johar directs. He and Khan have collaborated on several projects in the past. Khan said he hopes his the movie will help change practices such as racial profiling -- a procedure he is familiar with through personal experience. Khan was stopped and questioned by immigration officials at New Jersey's Newark International Airport in August, an international incident that grabbed headlines. The star said he's resigned to being routinely questioned in airports, which he says is a sign of the times. "This is the world we have created. We are all paranoid of each other," he said. But he also wants to challenge those notions with his new drama. "I know it's very idealistic and utopian, but I believe we need to just let everyone not be judged in terms of religion, groups or nations or region." "My Name is Khan" may be naive, but the actor said, "that's what's the most beautiful part of the film. It's like your children, it's simple and it's innocent."